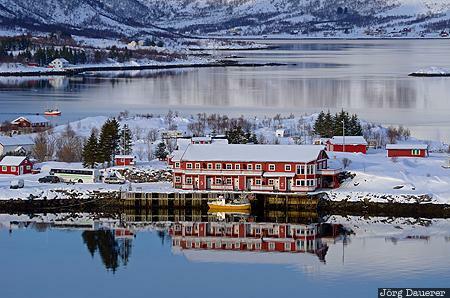 Reflexions of a red house in Austnesfjord between the snow covered mountains of the Lofoten near Sildpollnes along on the Sildpollneset peninsula. Sildpollnes is in the north of the island Austvågøy. Austvågøy is part of the Lofoten archipelago north of the arctic circle in Nordland, Norway. This photo was taken in the afternoon of a sunny day in March of 2013. This photo was taken with a digital camera.